October 19, 2018 – Alma, NB – Fundy Salmon Recovery (FSR) released over 600 wild endangered inner Bay of Fundy (iBoF) Atlantic salmon into the Upper Salmon River in Fundy National Park today as part of its ground-breaking, collaborative recovery program. The inner Bay of Fundy population of salmon has been listed as endangered under the Species at Risk Act since 2003. In an effort to save this declining population, some of the last remaining wild salmon of Fundy National Park were collected for “live gene banking”. This has protected the unique genetic lineage of this population which would have otherwise been lost. Fundy Salmon Recovery is working on two inner Bay of Fundy Rivers and the release in Fundy National Park follows the release of salmon into the Petitcodiac River system by Fort Folly Habitat Recovery. 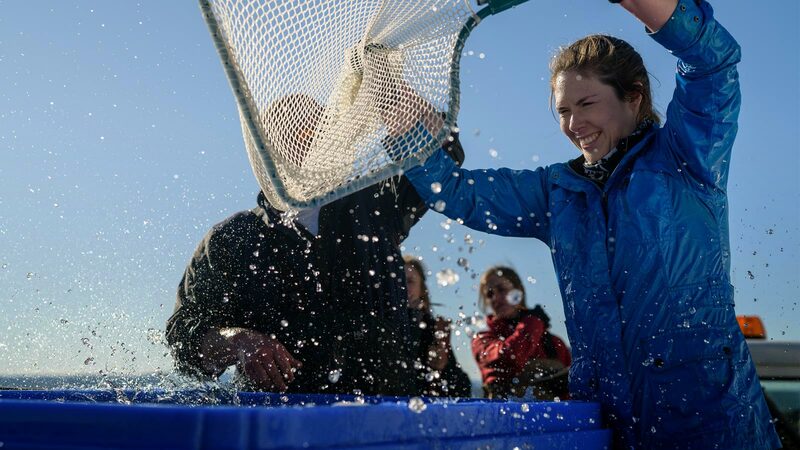 Wild endangered salmon are grown to maturity on the world’s first marine conservation farm dedicated to wild Atlantic salmon at Dark Harbour on Grand Manan Island, NB. Cooke Aquaculture operates and maintains the farm with assistance from the Atlantic Canada Fish Farmers Association. Salmon are health tested in the rivers and on the conservation farm by Province of New Brunswick veterinarians for introductions and transfers permits, with routine monitoring and surveillance by Cooke veterinarians and fish health staff. To help ensure the protection of the Atlantic salmon during their freshwater life stage, local law enforcement agencies are working together as part of the Atlantic Salmon Law Enforcement Coalition. Together, the coalition has increased joint patrols and surveillance on inner Bay of Fundy rivers, especially those in which there are active recovery efforts. Parks Canada is proud to present the research and recovery successes of Fundy Salmon Recovery to the public. Through programs like “Swim with Salmon”, “Be a Biologist for a Day” and our partnerships with academic institutions, Canadians have a variety of ways to build their awareness of species at risk, and to connect to nature at Fundy National Park. In managing national parks, Parks Canada maintains or restores ecological integrity, and provides Canadians with opportunities to discover and enjoy them.